← Update for February 2012 – just a flavour of what we have been doing. Wednesday 7th. March. At the third attempt, (following two postponements) had lunch with ‘aaa’ at Swindon and returned via Eastville Park in Bristol to respond to three calls received in quick succession concerning a ‘tackled’ juvenile swan. On arrival, discovered very quickly nothing could be done there and then – bird appeared to be ‘moored’ out in the middle by a long length of line coming from his beak, and so tomorrow it will be necessary to return with the inflatable. (As a footnote, there were 11 adults on the water that afternoon – never, in all the time we have been coming here have we ever seen more than just the one family). Meanwhile, back at the ranch, there is desperately sad news from Blaen-y-Pant (Newport); the female of a long established resident pair is dead, and so a post mortem is an absolute ‘must’. Thursday 8th. March. Set off early with inflatable and body of dead swan for pm aboard, and heading for Eastville Park. (Had to divert en route to Llanwern to assess possibility of catching a Canada Goose with a nasty looking leg injury; very quickly came to the conclusion there was no chance!) On arrival, met with Alan C who has been a great help in recent times. Our swan had freed himself overnight, but was still trailing a long length of line – maybe as much as 10 metres. He is now back with his parents and, albeit it a bit warily, is coming in reasonably close for food. At this location, it is usual to catch a swan very easily because they do come in really close, but on this occasion there was just enough doubt to make the use of the swan hook essential. That done, and the line cut, it was time to head off for Shepperton with the little swan, just to check he wasn’t also carrying a hook; little point releasing him at EP with all the territorial mayhem there, likely to continue for some time, and, for sure, he would become embroiled in it. (While all this was going on, received a report from the canal back in Newport of an injured duck; observing how extremely difficult ducks are to catch, all I could do was promise to have a look as soon as I got back). And so, finally to Shepperton. An x-ray of the body of the dead swan suggested the cause of death might have been because she was ‘egg bound’; how very very sad. Thankfully, the juvenile appeared not to have ingested a hook, so he’s fine. Next up was a call from someone living between Cardiff and Barry we had visited two years ago to deal with a dog attack. This time it sounded like a serious territorial dispute. Fortunately Steve lives not too far away, and hopefully he would be able to deal with this, so I gave Sarah his number – and yes he managed to secure the victim and get him to HQ. At some time amidst this lot there came another call about an adult with a broken wing somewhere south of Ross-on-Wye, at Kerne Bridge; question – would I be able to get there before it got dark? Time to head west; at Junction 6 on the M4, the phone rang – it was the Highways Agency asking for help! 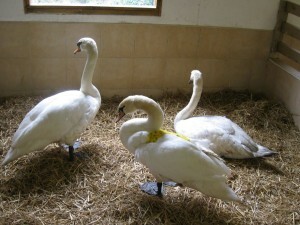 They had contained an adult swan which had come down on the M4 eastbound(!) just west of Junction 11. Time for unaccustomed use of accelerator to Junction 12, get off and head back east again, where a sizeable posse of orange coated guys were waiting. The swan was extremely lucky; he had succeeded in not getting himself killed on the M4, and also managed to avoid the railway line which passes below the motorway at that point – an incident down there would have been every bit as bad …. Anyway, loaded him into the car and now its time to head west – again! The route to Kerne Bridge was via Swindon and Gloucester with the worry about not knowing if it would be possible to find the swan if the people working in the area had finished work and gone home. Thank goodness the fates were kind, and I was able to receive detailed instructions as to how to find the casualty – in the lower part of a huge field bordering the River Wye, and some little way below Goodrich Castle. As I approached, still in the car, along what amounted a causeway – I imagine the field in question floods very easily at certain times of the year – I could count roughly 30 – 40 swans, and all showing some unease at my appearance, and therefore starting to move away from me. It was time for a bit of both quick thinking and quick moving; stop car – change shoes – retrieve two swan hooks from back of car plus one swan wrap. The casualty was very obvious with a badly dropped wing on his right hand side. It was absolutely essential to get between him and the river – if he reached the river, there is no question but that the game would be up. So what a pity this next scene was not videoed; there I was, making a pretence of running as fast as I could – not towards the swan, but on a line such as to cut his route to the river, and all around the rest of the swans were getting out of the way – many of them taking to the air! Suffice to say, the capture was made, albeit somewhat breathlessly. What was interesting about this swan was that, despite what appeared to be plentiful grazing, he was, in my view underweight at just 6.9 kg. And so back to Newport – a mere matter of 340 miles later! Friday, 9th. March. So, if you’ve counting, there are three swans to go to Shepperton, and here they are, actually in the pen which had been reserved for them at the National Swan Sanctuary! 1. Crash landed on M4 J11. 2. Centre. Broken wing; Kerne Bridge. 3.Right. ‘Grubby’; territorial dispute – Vale of Glamorgan. After all of this, maybe it won’t come as a surprise, the journey home was not a direct one! A few days earlier we had received a report of a juvenile cowering on a marshy lake at Cannop in the Forest of Dean – obviously hoping father couldn’t see him or forgotten about him; his location was such a rescue was out of the question. Even so, we continued to worry about him/her. Anyway, as far as it was possible to tell, it appears the bird had somehow managed to escape. Finally, there was a concern about a dead swan at the confluence of the rivers Monnow and Wye at Monmouth. Locally, there was a worry it might have been the cob from Monnow Bridge which had perforce been released elsewhere, might have returned and run promptly into territorial trouble. The bird carried no rings, and so the precise detail of what actually happened will never be known. And so, apart from a ‘tackled’ moorhen at St Georges Park in Bristol on Saturday (10th) that was quite week, and it should be easy to see it is impossible to be in more than one place at a time.